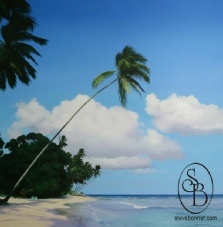 If it's prints of big, bright, paintings of beautiful Barbados you’re looking for you'll find them here. High quality reproductions, signed and numbered by the artist, on canvas or paper, these paintings feature the beautiful beaches and landscapes of this fabulous island. 'I think this painting of a fishermans house in St. Phillip, Barbados, is both enchanting and dramatic. It captures that strange clear light as the sunlight creeps under advancing storm clouds - possibly the only time I've been able to paint tropical greens in shades of Veridian.' 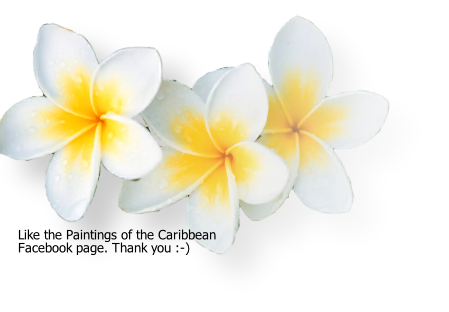 -SB. 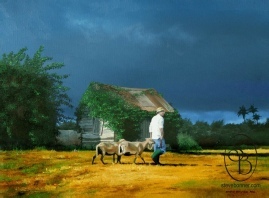 'Rain laden clouds and the last rays of the setting sun illuminate this farmer in St. Phillip, as he leads home his sheep - I love this little painting' -SB. 'Late afternoon on the West coast of Barbados. A magical time of day, when the sun is low in the sky and the colours are a little stronger, the shadows a little deeper. A very evocative painting!' -SB. 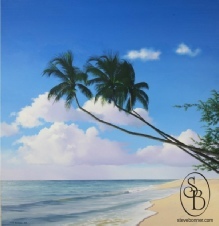 'Situated on the tranquil West Coast of Barbados, this is a view south towards the group of palm trees featured in the Sandridge Palms painting.!' -SB. 'The West Coast and this fabulous bay is home to Lone Star, The Royal Pavilion and, tucked away between the palm trees, Ju-Ju's, which just happens to be the artist's favourite beach bar.' - SB. 'The meadow above Bottom Bay in St. Phillip, Barbados. This was one of those days where it alternates between sun and showers. Standing on the rain-soaked cliff the clouds were, for the moment at least, releasing their deluge into the Atlantic for a change.' - SB. 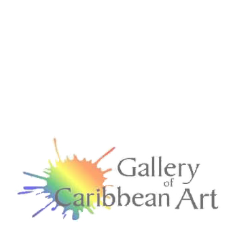 ORIGINAL PAINTINGS available from the artist or from The Gallery of Caribbean Art in Barbados.